A lot of times I hear people say they think blue is a cold colour, and that predominant use of it in a room or space, makes the room feel cold and uninviting. I guess technically, or scientifically, blue is a cold colour. 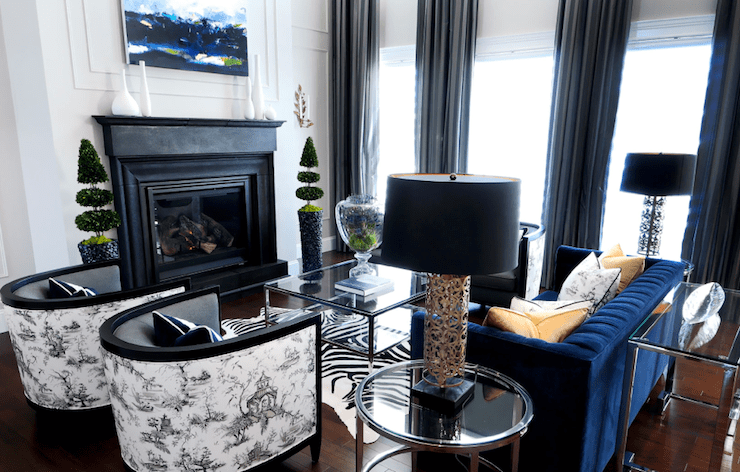 But that doesn’t mean that the use of blue in a design scheme makes a room or space feel cold. And there’s blue and there’s blue. Check out these examples. Would you feel cold or uninvited in these rooms? Mathilde from the Netherlands shared this picture with me. She writes: “We have this amazing accidental view. From our bed we can see the river Linge and the horses on the other side. We also discovered that the sun rises right where we can see it, and we have the best view as we don’t have any curtains yet. When we bought the house, we knew we’d have nice views but these beat all. This made us decide not to get curtains all together. Last week, when it was so cold, and the river was frozen over, I saw ice skaters coming past my window. As I just had a baby and was still in bed, I was extra pleased with such a romantic distraction!